CSUN's Scorpion Mobile Robot Team tied for second overall at the 21st annual Intelligent Ground Vehicle Competition. From left: Hamid Johari, chair of the Department of Mechanical Engineering, C.T. 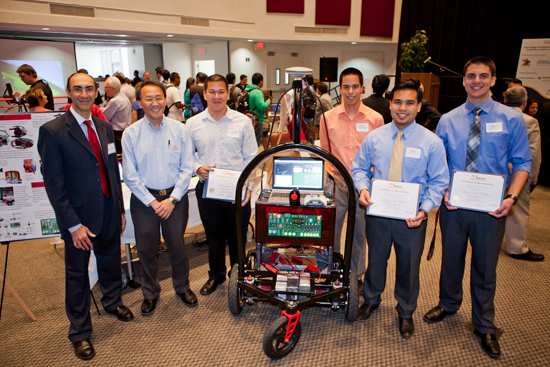 Lin, professor of mechanical engineering and the team's faculty adviser and student designers pose with the Scorpion mobile robot. California State University, Northridge mechanical engineering and electrical and computer engineering students have once again won the top spots in an international vehicle design competition. CSUN’s Scorpion mobile robot tied for second overall out of 52 entries at the 21st annual Intelligent Ground Vehicle Competition held June 7-10 in Rochester, Mich. The student team won first place in the Auto-Nav Challenge Competition. For at least the last three years, students in the College of Engineering and Computer Science have placed either first or second in an competition against some of the most elite engineering schools in the nation including the U.S. Naval Academy, Hosei University in Japan and Princeton University. “The fact that our Scorpion team won the Auto-Nav challenge, one of the most difficult challenges in the competition, speaks volumes about the quality of our programs and the abilities of our students to shine amongst the best in the world,” said S.K. Ramesh, dean of the college. CSUN’s IGVC team has designed and engineered an entirely new platform for 2013. The Scorpion is a differential driven vehicle with a lower center of gravity compared to its predecessors. The entire process, from design to fabrication and integration of sensors and new algorithms, was completed in the 2012-2013 academic year. Some of the new innovations in this platform include a simplified decoupler, new path planning algorithm, and a fully adjustable suspension system. The vehicle was designed by 24 students, including 17 from mechanical engineering and seven from electrical and computer science engineering. The mechanical engineering majors: Brionna Stearns, Daniel Franco, Merqui Absalon, Jeffery Ferree, Brian Burrows, Tynan Kelly, Daniel Kim, Brian Bati, Andres Lopez, Sasan Akhavan, Richard Walker, Derek Dreblow, Diego Castillo, Christopher Coria, Ali Ghazal, Amanda Martinez and Chase Warmuth. The electrical and computer science majors are: Hovhannes Mkhitaryan, Xian Li, Heros Nasiri, Christopher Do, Hugo Anderson, Abou-Baker Kadmiry and Freddie Ayala.